Planet Vegmel is turning three! To celebrate, there will be a birthday picnic potluck at Edinburgh Gardens on September 15th (a Saturday) from around 1pm. Come along, readers, bloggers and friends all! It'll be my first potluck in a year (since the 2nd Birthday Potluck, in fact! ), and it'll be great fun. There will be another zine! Maybe more badges! Maybe something new! You can find more details at the fb event page, which will include up to the minute updates if required in the event of rain. As I've previously blogged, living in Beijing has unexpectedly led to an amazing increase in my obsession with hotpot/steamboat. Frequently I go to Little Sheep, which is a franchise that has a location delightfully close to my house on Ghost Street; however Wendy had mentioned that if there was anywhere a Beijinger would go to hotpot, it would be Haidilao, so when GY suggested we go to hotpot before I left, I was eager to suggest Haidilao. I have in the last week been to Haidilao twice (once with GY and LN, and once with Wendy), and I recommended it very much. 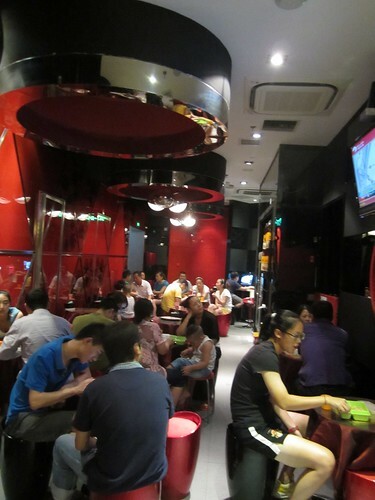 Haidilao is well-known for excellent service. At the Sanlitun location I experienced a sort of valet-bike parking, where someone helped me find a bay for my bike, and asked if I needed help carrying my bags inside, and when Wendy and I specified that we were strict vegetarians they went out of their way to double check what that meant stockwise, and what would be okay and not okay. 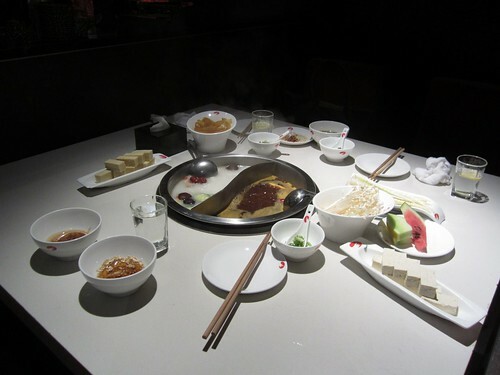 It is more expensive than some of the other hotpot restaurants I've been to here in Beijing, though. And it's much, much harder to get a table. At the Wangfujing branch we booked ahead, and the waiting area was full when we went to depart; at Sanlitun we ended up waiting for about 40 minutes to get a table. They provide you with snacks, games to play, and a free manicure while you're waiting for a table, and LN says she often doesn't book if she needs a manicure, so she can wait and get one. The mushroom broth was amazing, filled with mushrooms and some garlic it had such an excellent flavour. The spicy broth was also quite excellent. The thing I love about Haidilao is its excessive complementary condiment wall. 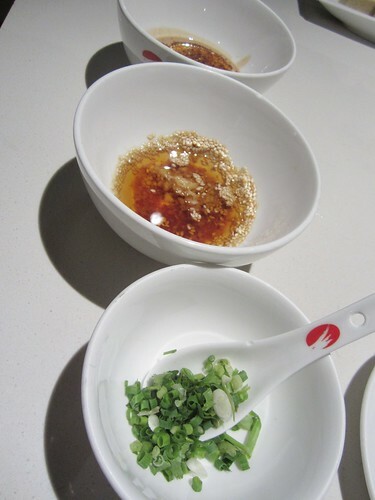 Mixing sauces is an excellent part of the hotpot experience - you can choose from (among others) soy sauce ("home made"), sesame sauce, sesame oil, fried peanuts, a soybean paste, a mushroom sauce, a variety of chillis dried, fresh and oiled, green things, vinegar, other types of nuts, and even msg, and that's all without touching the condiments I can't eat. LN introduced me to the concept of creating a dry rub for myself, she used a mixture of salt, dried chillis, and peanuts, which I thought was pretty excellent (though very spicy). 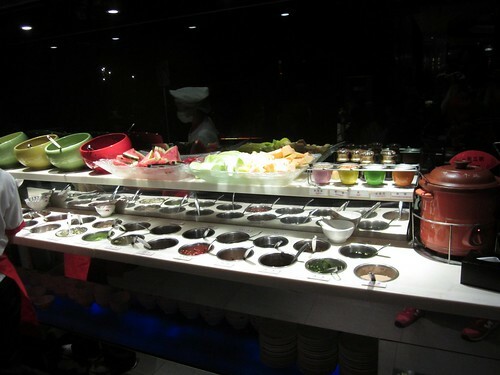 The condiments bar also includes a variety of fruits, a pumpkin soup, and some cold Beijing salads (such as tudousi and the smoked tofu strings thing). 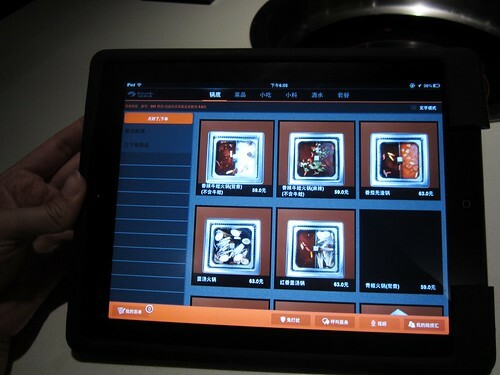 At Wangfujing ordering takes place via ipad, all in Chinese but with pictures. Ordering at Sanlitun is via a sheet of paper all in characters, but some places (such as Little Sheep) have menus with pictures if you ask for it, so that might still be available. Haidilao also has noodle dancers, lovely clean toilets, and an awesome array of tofu to put in the boat. Some locations (such as Wangfujing) have lifts, but others are old and not at all accessible. Website allegedly has an English version but I've never been able to access it. When I first moved to Beijing I gave up coffee, on the grounds that it's difficult to find a good coffee in China, and impossible to find a soy coffee. I thought, I can do this for a year! 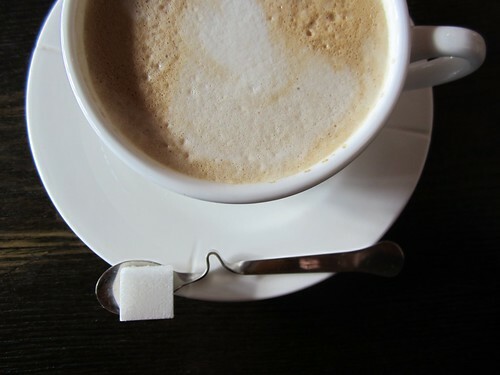 I was wrong, and shortly after my second month began, I found myself trying to track down some sort of delicious coffee. Part of the reason why I'm vegan is because I'm lactose intolerant, a(n at the time) distressing genetic quirk I picked up from my Chinese mother. Asian people have an increased propensity towards lactose intolerance! 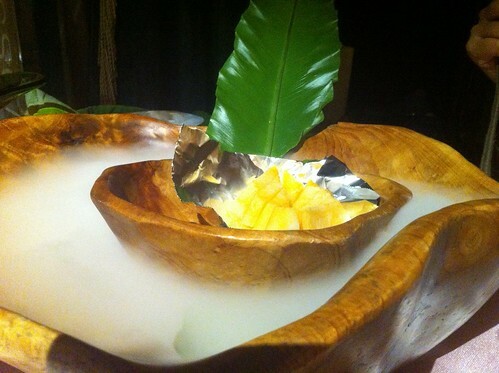 Chinese culinary tradition is well known for its soymilkyness! I can buy warm soy milk on my way to work for breakfast on cold winter mornings from little street stores! So you would think, given this, that finding a soy coffee in Beijing would not be that difficult. Sadly you would be wrong. 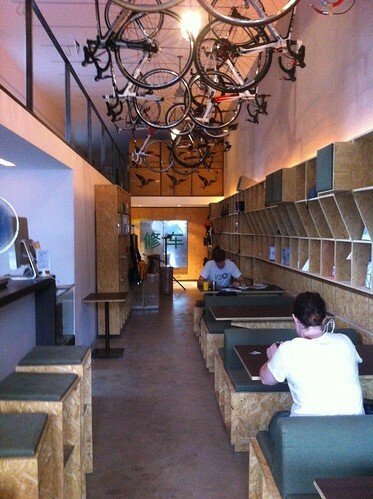 My new go-to for a soy, and delightfully a soy flat white, is Serk cafe on 北新桥三条 (beixinqiaosantiao), a Melbourne-style cafe run by a Melbunnie, with bikes hanging from the ceiling and an awesome fitout. They even charge extra for soy milk, can you get more Melbourne than that? It is, however, the only place in Beijing that you can buy a soy flat white (not even the New Zealand inspired Flat White Cafe does a soy flat), and I'm willing to put up with a lot for such a delight. And you can bring your keep cup! However alas Serk is not open Mondays, and not open before 11am, so it is useless for an on my way to work coffee purchase. 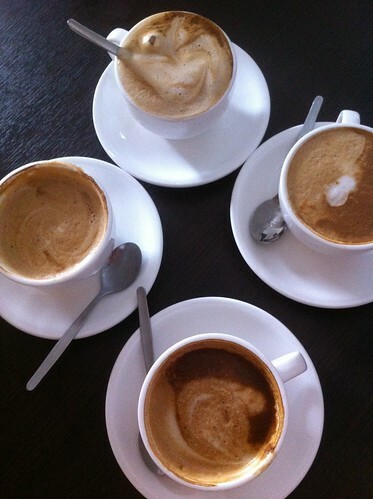 Other than Serk, it's sadly lattes all the way. I go quite frequently to the Vegie Table on Wudaoying Hutong, where I can get the world's largest soy latte (or a latte with coconut milk, which is fun). They don't do takeaway but if you bring your own cup they'll whip something up for you. This coffee is nice enough but it always leaves me with a funny after taste. More frequently, though, I go to Starbucks for a soy latte in my reusable Starbucks cup (because oh, don't try to convince them you should be able to use your keep cup). This is fine and functional but not what one would call a coffee, more a coffee flavoured beverage. In Australia I don't drink coffee after lunch, but I can drink a Starbucks coffee as late as 5pm and still be fine to go to bed. Starbucks is funny here, it's mostly considered a bit of a dessert place, the most popular drinks seem to be the ones with lashings of cream on the top, and I know of business people who take their clients to Starbucks for a bit of after business lunch dessert. Don't go to Costa Coffee for a soy coffee. They use Asian soymilk, which is definitely not the right thing to use in a coffee. 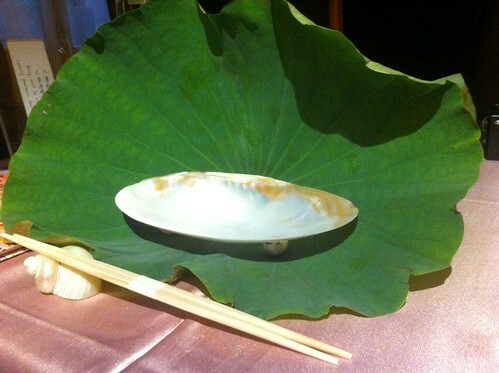 Pure Lotus is probably one of the most well-known vegetarian restaurants in Beijing, as well as probably the most expensive. So Wendy and I decided it was a must try before my imminent departure. I got lost and ended up late, thanks to the annoyance of the Beijinger website giving me the wrong address. Eventually I found the right complex, and then was directed on my way by ushers in pink and grey clothes, those pyjama pantsuits. At the front door I was greeted by wait staff in shapeless glittery dresses, and directed up a million flights of stairs to where Wendy was very patiently waiting for me. The lighting was very poor, so I didn't end up taking too much in the way of photos with little orange toy camera (an aside: looking at some photos my brother took of the night skyline in Singapore recently, and they've turned out beautifully. I really miss having a real camera), especially as I was sitting in my light source. Not pictured here: the juices we chose not to order, on the grounds that they were 150元 a glass. Depending on the day's exchange rate, 150元 is at least AUD20! No, no thank you. We had boiled water. Our place settings were these interesting but obviously not-vegan shells. A very interesting aesthetic! We ended up ordering six dishes: some bao, "japanese tofu wrapped rice" (this turned out to be plain inari), smoked tofu with chilli and beans, a hor-fun thing, a kind of sushi cones thing, and (not on the menu, we had to ask for it), their famous vegetarian peking duck. 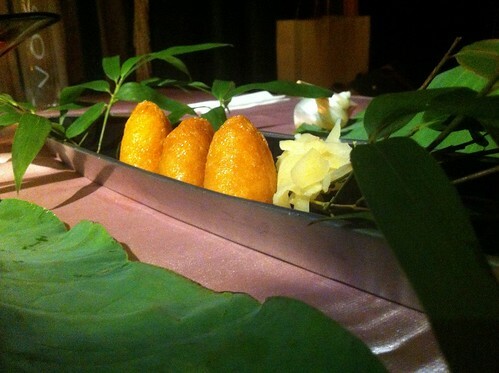 Don't get me wrong, I love inari as much as the next person, but the best thing about these inaris was the presentation, here in a boat with some pickled ginger and a whole lot of leaves. The smoked tofu was not as delicious as I had hoped it would be, there was a funny aftertaste and absolutely none of the promised 辣 (chilli). Duck was good, but nothing more special than the duck I've had again and again at Baihe (and for half the price, and five minutes walk from my apartment). 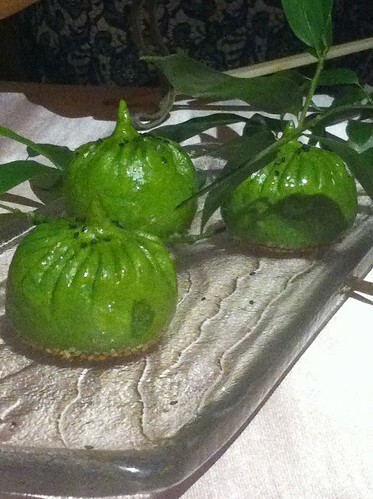 These baos were filled with a mushroom-nori combination, and were incredibly heavy going. They came last, and in the end I think we had to leave one behind. But look at them shaped like fruits! Finally, we ended the meal with a complementary fruit bowl - this thing was massive and contained about half a dozen slices of rockmelon, which Wendy doesn't like so I ate it all (even though I'm not a huge fan of Beijing's rockmelon). Afterwards, we were escorted out of the complex by the pink and grey pyjama-clad people, this time holding giant lanterns on sticks that were held close to the ground to light our way. Pure Lotus was an experience I had to have - a large number of people had stated it as a place to visit, and I'd heard so much. The notable thing abut it is definitely the presentation. But for me, one visit was enough. Not accessible at all (little step into the first floor, awkward seating, dim lighting). Chinese menus with hilarious and occasionally useful English subtitles. Open every day, 11am-11pm. Wendy and I went on an adventure to Wangfujing yesterday, because we want to stock up on Chinese cookbooks before we leave Beijing. It was pretty exciting - this is not even half of the vegetarian section. 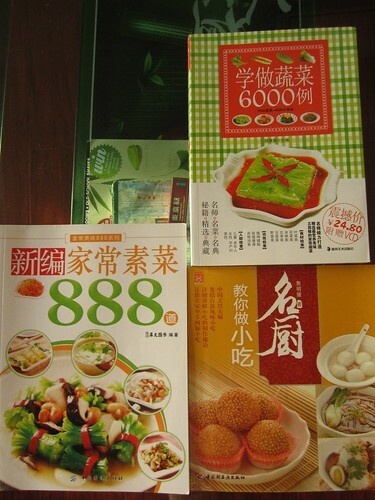 Of course you may recall the problems I have at times had with being vegetarian in Beijing - enduring meat as garnish, 'it doesn't have egg, it's sweet' - so some of these vegetarian cookbooks have the occasional shrimp garnish, but the ones I have are super awesome and I'm so excited. I have eaten so many amazing dishes while I've been in Beijing, that I cannot wait to start making these at home, and for my friends and family at home. 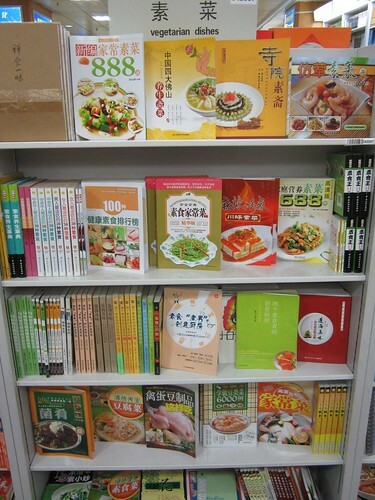 It was funny, my excitment over these cookbooks. I've mostly moved on from cookbooks in my life, because it's so easy to find recipes online. But a lot of this stuff I've never been able to find while searching in English, and when I google in Chinese often my eyes start to glaze over, and it's hard for me to skim read. So these beautiful cookbooks, with pictures, sometimes step by step. Anyway, prepare yourselves, vegetarian Melbourne, for some delicious new experiments.